We love spotlighting our trainers’ unique journeys to becoming Pilates Instructors because we know that no matter who you are, incorporating Pilates into your workout routine can be beneficial. Prior to MOVE, Fitness Instructor Sara Schuman used to teach college Philosophy. After a visit to her doctor in 2012, she decided to prioritize her wellness and discovered many fitness options to keep herself engaged and motivated. Since then, she has lost over 50 pounds, become a Pilates Instructor, HIIT, Barre, and certified American College of Sports Medicine (ACSM) Group Fitness Instructor, and redefined wellness for herself. Sara became interested in Pilates as a career because of Pilates’ functionality and ability to heal. Pilates “helped [her] with a lot of back issues and shoulder issues,” and “help[ed] her be upright.” After completing the MOVE Instructor Training Program, Sara wanted to share the power of rehabilitative movement with others. “I am able to do things I wasn’t able to do about 4-5 years ago,” Sara says. 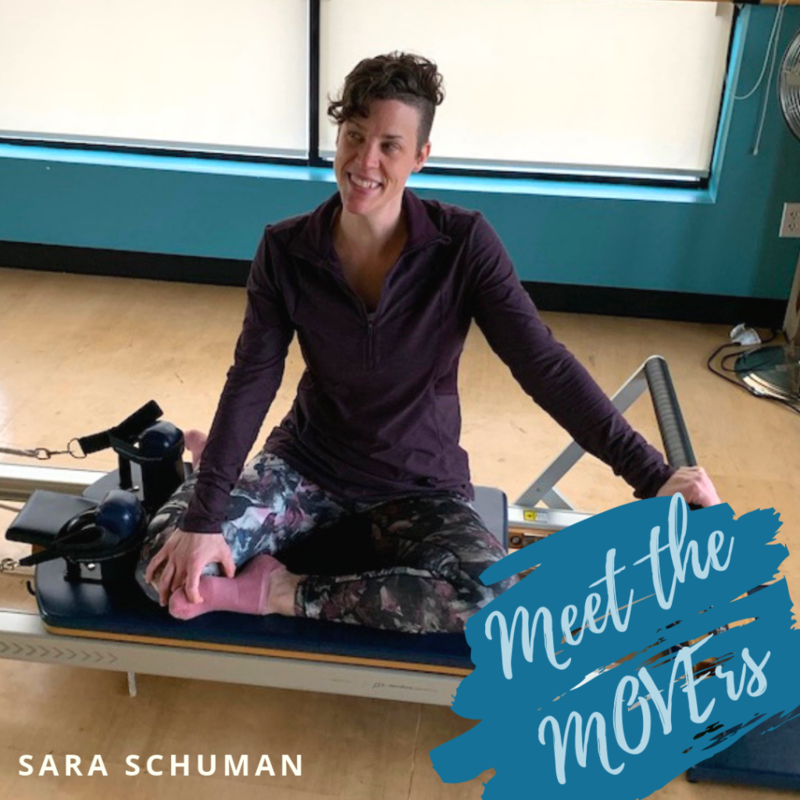 Wanting to share the benefits of Pilates with those who have been injured or limited in their mobility, Sara also became involved with the MOVE Transition Program. In the Transition Program, Sara teaches Balance Classes for populations who cannot get on the ground and trains clients privately who need individualized support in reaching their health goals. Come try a session with Sara today! Sarah Schuman is a Pilates instructor and group fitness instructor at MOVE Wellness. Schedule an appointment with her today! Please contact the studio at 734.761.2306 or office@movewellness.com for more information.